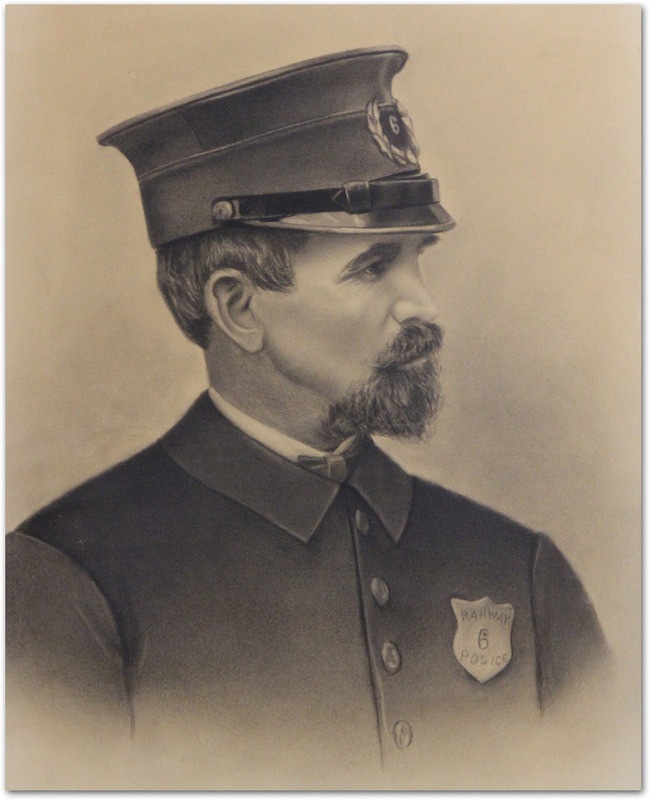 The Rahway Police Department was officially established on May 3, 1858, at the first meeting of the city council. The names of four constables, who had been elected by the people, were announced at that time. The first ward selected John Harvey as their constable, John Cladek was chosen by the second ward voters, Benjamin Perker was chosen by the third ward and the fourth ward elected John J Brown. The city council then elected James M. Velvey and George F. Webb to serve as police justices. By 1864 Rahway had a police chief and five patrol officers who operated out of a headquarters location on the corner of Main and Monroe Streets. Minute books of the 1866 council meetings show that the council was sympathetic to the needs of the police force. After presenting the council with a petition for uniforms, an appropriation of two hundred dollars was made. The council stipulated however, that the uniforms had to be of dark blue cloth, and that each man would be supplied with one cap, one overcoat, and one pair of pants. The council also agreed to pay the police chief a salary of three hundred and sixty five dollars a year. Until 1882 anyone in need of an officer would have to summon him personally at the headquarters. An officer would then be dispatched “to the scene of the crime” on a bicycle. In those days the officer might have been called to apprehend a barn burner or to levy a five dollar fine on a good citizen who failed to clear his flagged walk within six hours after a snow storm. The year 1882 marked the first time the telephone was used by the police as a means of communication. A phone exchange was placed in the former Exchange Building on Irving Street and citizens encountering problems could call from any house that happened to have a phone. However the Squier Family on St George Avenue was the first and only family to have a phone in Rahway. A 1906 revision of the City Ordinance established the Police Department as follows; “There is hereby established a police department which shall consist of the Chief of Police, a Roundsman, one or more Desk Sergeants, as many patrolmen and such additional officers as the Common Council may from time to time appoint, who shall act and be known as police officers for said City”. Call boxes were installed throughout the city in 1907 facilitating community-police communications. Police headquarters moved in 1902 to a two story brick building on Main St. It remained there until 1934 when the headquarters behind City Hall on Campbell Street was obtained. The building was formerly a part of the high school complex. By then the department consisted of a chief, two captains, four lieutenants, twelve Chancemen (men called for special duty), and one civilian. Automobiles had replaced the bike and the police fleet consisted of two automobiles, two motor cycles and a Black Mariah. Special Policemen, known as Chancemen, worked part time for the police department and were eligible for appointment as regular police officers when vacancies occurred in the ranks. The first patrol officer hired under the Civil Service System was appointed to the department after litigation by the Chancemen who had not made the civil service list failed. All appointments to the department since 1942 have been made under the Civil Service System. A teletype receiver was installed at headquarters in 1931 and in 1936 police radio communications were established. In 1973 police radio communications were improved with the establishment of a UHF radio/repeater system under the auspices of the Middlesex/Union County Communications System. In 1974 a New Jersey State Criminal Justice Information System computer terminal replaced the teletype receiver. This terminal provided two way telecommunications with the National Crime Information Center (NCIC), the New Jersey Law Enforcement Telecomunications System (NJLETS), and the National Law Enforcement Telecommunications System (NLETS). In 1976 the terminal was replaced by a new computer terminal operated by the Union County Law Enforcement Communications System. The Rahway Police Department moved from Campbell Street to its present location at East Milton Avenue and Main Street on March 6, 1981. At that time, the Rahway Police Department consisted of 73 officers. Over the next 20 years, the department began to expand in both manpower and technology. The Rahway Police Department continued to investigate an increasing volume of all types and manners of criminal activity. At the same time, the department began a progression towards Community Oriented Policing. The Rahway Police Department is presently made up of 89 officers, 16 patrol vehicles, 14 unmarked vehicles, 2 motorcycles and a paddy wagon. The compliment of officers is diversified and is representative of the community at-large. The first female officer in the history of the Rahway Police Department, Janice Witheridge, was hired in February 1988. Each officer on the force has been assigned his or her own portable radio and pager. Each patrol car is now equipped with a Mobile Video Recorder (a camera), a laptop computer and in the near future will also be equipped with a Global Positioning System (GPS). In addition to the traditional police divisions such as patrol, general investigations, traffic and juvenile, the Rahway Police Department also has a Community Relations Office (C.R.O.). This unit’s primary responsibility is to assist in “quality of life issues” throughout the community and to work closely with all of the departments and agencies in the City to improve the quality of life and services to our citizens. Four police officers assigned to this unit also patrol the city on bicycles, weather permitting. This unit was direct result of grants obtained from the federal government to create and foster better police/community relations. The Rahway Police Department has conducted hundreds of thousands of investigations during its history. However, there are two murder investigations, which stand out in the history of the department and resulted in nationwide notoriety and publicity. The first of these two crimes occurred on March 26, 1887. At 6:30 am on March 26, 1887, a corpse which was frozen to the ground, was found by four men several hundred feet beyond the Central Avenue Bridge, near Jefferson Avenue. It was the body of a young woman. Her throat had been slashed in two places, and her face was discolored with bruises. Alfred, Frank, Thomas and Irving Worth wasted little time in rushing back to town to alert the authorities. Police Chief William Tooker, not used to such excitement in the quiet town, hurried to the scene and made his initial report. The girl, whom he did not recognize had been brutally murdered. She was blue-eyed, brown-haired, and appeared to be in her early 20’s. She was dressed in a dark green cashmere dress, trimmed with green feathers, yellow kid gloves and foreign good shoes. A fur cape, which had been torn to shreds, lay near her body, as did a black straw hat with red velvet trimmings and a black dotted veil. Her body was surrounded by footprints in the frozen mud. As Tooker was examining the body, an officer who had been searching the area, brought back his findings. Near the river he found a small black bag that contained small articles, some that might have belonged to a man. He also found a basket containing nine (9) eggs, all but three of which had been broken. Across the fence, a pen knife with a turquoise handle was discovered. This was all that Chief Tooker, or anyone else for that matter, would ever find in reference to the murder. A special council meeting was held the next evening to take action concerning the advisability of offering rewards for the arrest and conviction of the murderer of the unknown girl. Rewards were offered by Governor Green and Mayor Daly to anyone who could provide them information. The strange case focused world-wide attention on Rahway. Pictures of the girl were published in leading newspapers and crime magazines across the country. Professional and amateur detectives came to Rahway to try their hand at solving the mystery. Hundreds of persons filed through Ryno’s Morgue to look at the body. The results were always the same, no one recognized her or found any additional evidence. The investigating jury met on four occasions. They spoke with doctors who had examined the body and tried to turn up new clues. Mark Keefe, one of the jurymen, said he had seen the girls basket in Baker’s grocery store more than a month before and that Mrs. Baker had mended the lid. Billie Byrnes, a clerk at the grocery store, was called in and denied the story. After much work and many interviews they found themselves no more enlightened than when they had started. They assumed that robbery had not been the motive since she still had her watch and jewelry, and the reason for her murder remained an unsolved question. Two and a half weeks after she was found, the unknown girl’s casket was taken to First Presbyterian Church for services. It was carried by six New York reporters who were covering the story. However, it was not until May 2, that the body was interred, for it was retained by the morgue until that time with the hope that it might be identified. The unknown girl was laid to rest beneath a small tree in the Rahway Cemetery as the Reverend Gay read from the Bible. Though the girl was now in her final resting place, the case was not closed. One man who didn’t want interest in the crime to die was Isaac Crane, who saw a way to make money from the unsolved mystery. Crane rented a store on Cherry Street and on the Fourth of July exhibited a rooster he claimed was hatched from an egg found in the murdered victim’s basket. As it turned out, interest in the crime was still high. Several hundred people came to see “Mystery” the rooster and Crane smiled as he collected ten cents from each customer. In the middle of June, the case seemed to be broken. In Salem, Illinois, Kasper Shumbeck confessed to the crime. Robert Bowman, the man who turned him in said in conversation that Shumbeck had told him “I did something bad in New Jersey and it bothers me, almost to death”. After being put in jail he wrote his confession. Kasper Shumbeck comes and makes confession to Robert Bowman and J.W. Conley that on the thirteenth day of March 1887, at Rahway, New Jersey, in the afternoon, that he, the said Kasper Shumbeck and his friend John, a Swede, did kill and murder a young lady about seventeen years of age named Clairy. We met her outside of the town and killed her by the roadside. My friend John struck her with a club and I cut her neck with a pocket knife. I therefore demand that J.W. Conley, a constable of the county of Marion and the State of Illinois, take me in custody and have me dealt with according to law in the matter above stated and I hereby surrender myself into this charge. I hereby make the above confession to Robert Bowman, J.W. Conley and John A. Phillips on my own free and voluntary will, and no act of compulsion on their part. Shumbeck was sent to Rahway for interrogation. After several days of questioning, it was concluded that his confession was a fraud. In the next few years many people came forward with information, but like Shumbeck’s story they were not accepted as being the truth. A famous New York wax museum offered the city one thousand dollars for the girls clothing, but the offer was refused. The police department kept the girl’s belongings and would not give up hope that the case would someday be solved. The second case was the brutal slaying of Police Officer Charles Bernoskie on November 28, 1958. On a cold, rain swept night, while conducting a building check, Officer Bernoskie interrupted a burglary in progress at the Miller Pontiac Cadillac dealership at the corner of St. Georges Avenue and West Milton Avenue. Officer Bernoskie confronted at least one of his assailants in the rear yard of 453 W. Milton Avenue. A resident of the house was in the garage and overheard some of the verbal commands Officer Bernoskie was giving to one of the suspects. A short time later, the resident heard an exchange of gunfire. Officer Bernoskie, mortally wounded, stumbled into the kitchen area of a nearby house, collapsed on the floor and died. Two area residents out for a walk observed two white males running from a driveway in the vicinity of the reported gunshots. At the time of his death, Officer Bernoskie had a pregnant wife and five (5) small children. Despite an exhaustive and intensive investigation conducted by the Rahway Police Department and the Union County Prosecutor’s Office, no suspects were located. There was some physical evidence left at the scene of the burglary. The most notable and promising piece of evidence was some fingerprints found on a can of Prestone anti-freeze that had been moved from a storage cabinet during the burglary. The Rahway Police Department continued to pursue any and all leads that might help to identify the suspects responsible for the murder of their brother officer for over forty years. At one point in the investigation, a prisoner incarcerated in a Pennsylvania prison confessed to the killing. However, an investigation into his claim found that the prisoner had some serious psychological problems and had read enough about the case in newspapers to appear to be the suspect when in fact he was not. Detective William White of the Rahway Police Department was contacted by Postal Inspector Joseph Jakubiec in August of 1999 regarding this unsolved murder. Judith Sapsa, a female suspect under investigation by the Postal authorities for the crime of fraud and identity theft, implicated her brother, Robert Zarinsky and her cousin Theodore Schiffer in Officer Bernoskie’s murder. Detective White and Investigator Frank Pfieffer of the Union County Prosecutor’s Office conducted an extensive investigation into Sapsa’s allegation. A court order to obtain Theodore Schiffer’s fingerprints was obtained in Pennsylvania, where Schiffer was presently residing. Two fingerprint experts from the Pennsylvania State Police matched Schiffer’s prints to the fingerprints obtained in 1958. This became the turning point in this investigation. Theodore Schiffer subsequently was arrested and extradited to New Jersey. After much deliberation and legal maneuvering, Schiffer admitted his role in the burglary at Miller Cadillac. He implicated his cousin, Robert Zarinsky, as the killer of Officer Bernoskie. He also agreed to re-enact the crime and to testify against Zarinsky. Robert Zarinsky, at this time, was serving a 98-year sentence in East Jersey State Prison (formerly known as Rahway State Prison) for the 1969 murder of a young teenage girl from Atlantic Highlands. Zarinsky denied his involvement in the crime and was brought to trial in May 2001. Unfortunately, after a seven (7) day trial, the jury found Robert Zarinsky not guilty. Post trial interviews with the jurors revealed that they believed in their hearts that Zarinsky had committed the murder but there was insufficient proof after 40 years to convict him. He was subsequently remanded back to prison to complete his original sentence. The identification and arrest of the two suspects responsible for Officer Bernoskie’s murder provided the family with some closure. Furthermore, an important question that remained unanswered for over 40 years was answered. Officer Bernoskie fired all the rounds in his service revolver on that fateful night. Several of the rounds were accounted for but not all. During the investigation, Judith Sapsa testified that on the night of the murder her brother and cousin came home to their house in Linden. Both of these men had been shot. Judith’s mother removed a bullet from the chest of Theodore Schiffer and a bullet from the buttock area of her son. These individuals were never taken to a hospital and their respective families nursed both men back to health. All of the family members were sworn to secrecy and they all kept this vow until 1999. Police Officer Charles Bernoskie gave the ultimate sacrifice in the service to this community. His heroic actions on the night of November 28, 1958 were never known until the summer of 1999. His ability to wound both of his assailants, although mortally wounded himself, provided clear and convincing evidence that was directly responsible for the arrest warrants on both suspects. Both of these men bore the scars on their bodies where Judith Sapsa indicated Officer Bernoskie had shot them. Police Officer Charles Bernoskie was and is a true hero! !